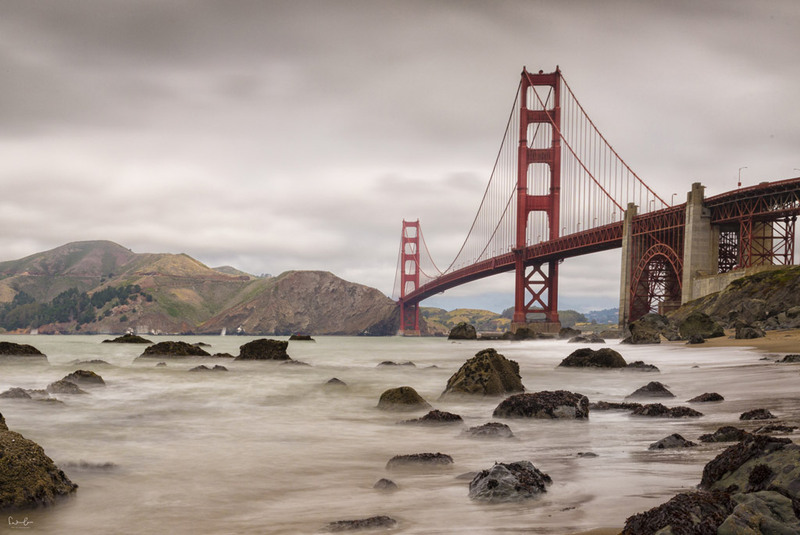 The Golden Gate Bridge is an awesome subject to capture with your camera. 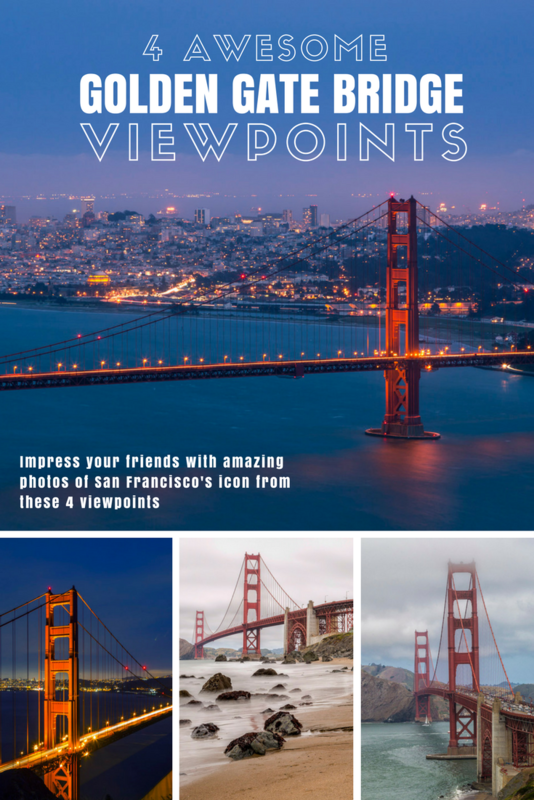 I’ve got 4 Golden Gate Bridge viewpoints for you, from where you have the best view on San Francisco’s landmark and you will surely impress your friends with some amazing photos of the Golden Gate Bridge. 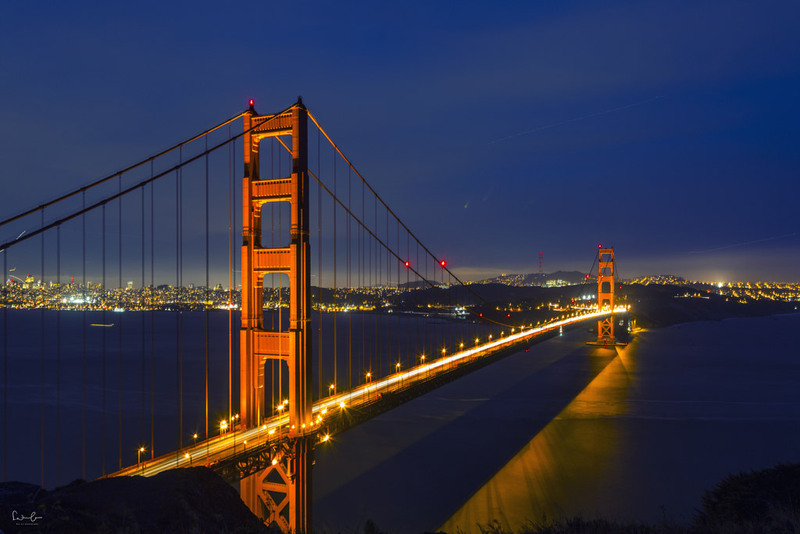 To me, there is hardly any other icon in the world which is so amazing than the Golden Gate Bridge. When I first saw it in real, my fascination was endless and I could not stop looking at her. Why? Well, first of all, I’m obsessed with beautiful bridges. 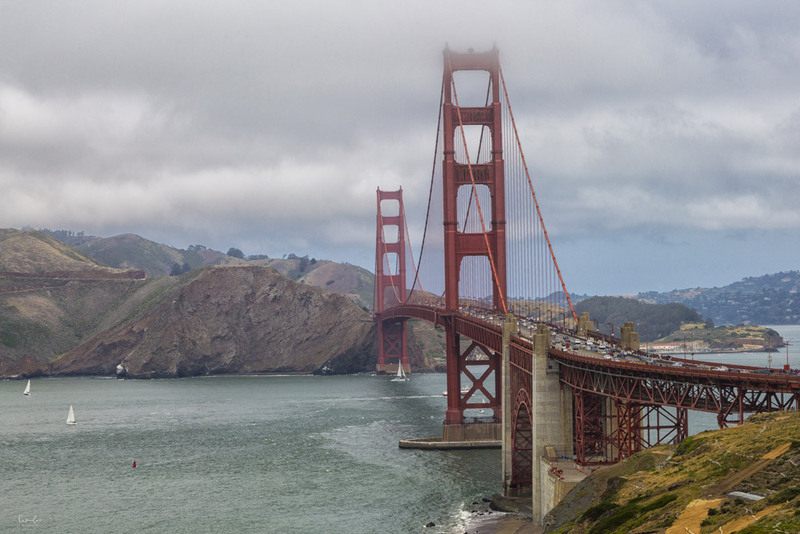 And then I connect this bridge with the American Dream, with freedom, with Scott McKenzie’s song San Francisco and all those feelings came over me when I arrived in the Belle of the Bay and first drove over the bridge. I arrived in San Francisco with the rental car and before I returned it, I drove over the bridge and then stopped at a car par at Presidio (GPS data 37.803217, -122.476164 parking space) on Lincoln Blvd. You will get there with public transport, too. I suggest you use the route planner of SFMTA. From Lincoln Boulevard watch out for the Battery to Bluffs trail that leads you straight down to Marshall’s Beach. From there you can capture the bridge and use the beach and some rocks as foreground. You can also take pictures on your way down to the beach. There are some vantage points from where you have a wonderful view, too. Marin Headlands Vista Point on Hawk Hill is on the other side of the Golden Gate Bridge. I was lucky because a friendly photographer from San Francisco took me there with his scooter. It is possible to get there with public transport, it just takes a bit longer from downtown. You could invest in a taxi on your way back, especially if you shoot in the blue hour – which I strongly suggest – and it’s dark when you’ve finished. From Hawk Hill, you see the Golden Gate Bridge from all its glory in a distance with the beautiful skyline of San Francisco in the background. This viewpoint is also on the other side of the bridge, but lower than Hawk Hill. You can easily combine both viewpoints Marin Headlands and Battery Spencer. Start on Hawk Hill with your first shots and then walk 30 minutes downwards to Battery Spencer. The view from here is amazing and you can capture great close-ups from the structure of the bridge. 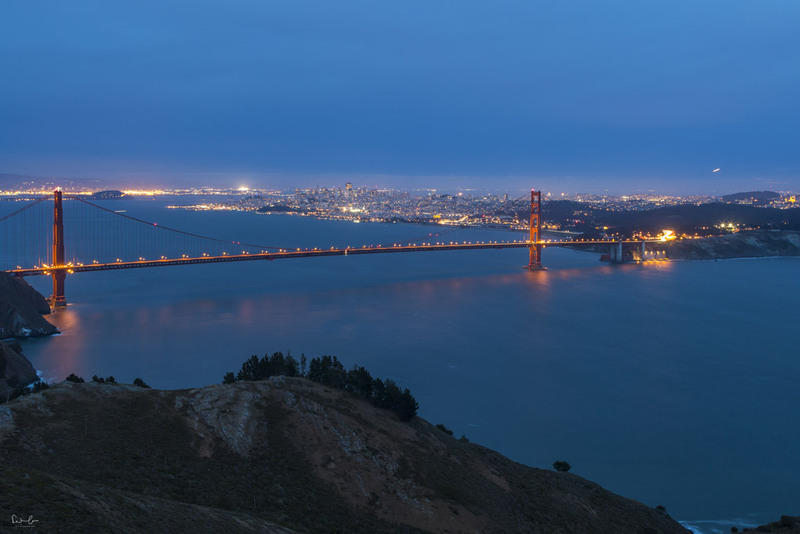 The bridge is in the center and foreground of your image, the skyline moves back and is a tiny detail in the background of your photo whereas from Marin Headlands the skyline is much more on the spot. Back on the San Francisco side of the bridge at Presidio, there’s Fort Point just around the corner of Marshall’s Beach. Fort Point is very easily reachable by public transport. Again, use the trip planner – it is so useful. The area at Fort Point is very nice for a walk along the waterfront. 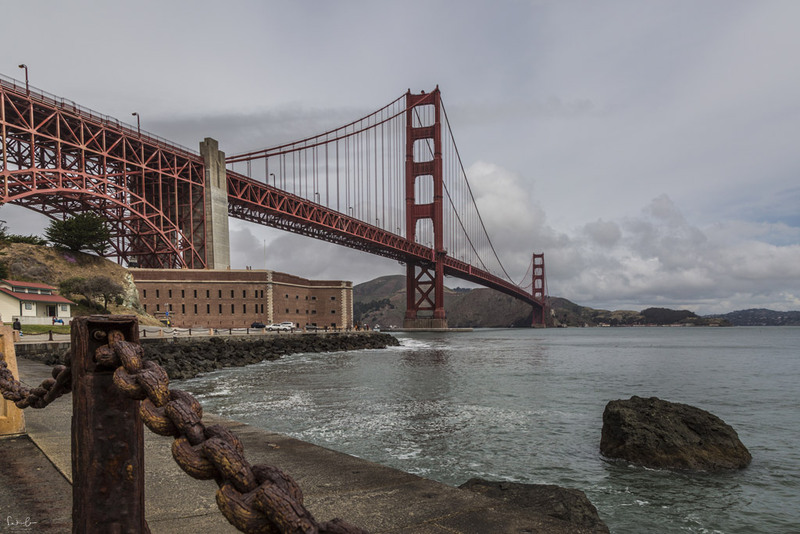 You can find your perfect viewing spots on the way towards Fort Point National Historic Site right at the end. Just one more thing to add: Take your tripod as well as an ND and graduated filter with you. Especially if you shoot during the blue hour you will need a tripod if you wish to get amazing photos without noise. Take long exposure shots with the ND filter, a graduated filter helps you when the sky is very bright. Writing about the Golden Gate Bridge makes me wanna go back there in this very second. 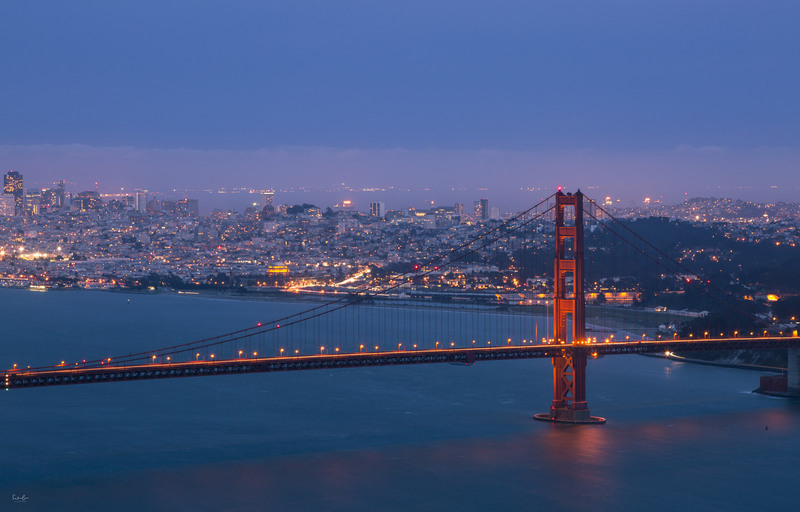 Have you seen my Beginner’s guide for San Francisco yet? If you plan a trip, make sure to read it. And I’ve got 10 free things to do for you in San Francisco. Check them out, too. 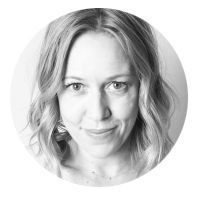 Disclaimer: This article contains affiliate links which means I will earn a small commission if you purchase/book through my links. This is without extra costs for you. Thank you for your support. wirklich sehr tolle Aufnahmen von der Golden Gate Bridge. Die 4 Standorte stehen auf meiner ToDo Liste für den nächsten San Francisco Trip.